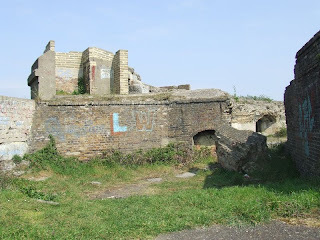 This fort was one of a number built to protect the Thames Estuary in the late 19th Century, after the Royal Commission of the country's defences, although it is built of the site of an earlier battery. 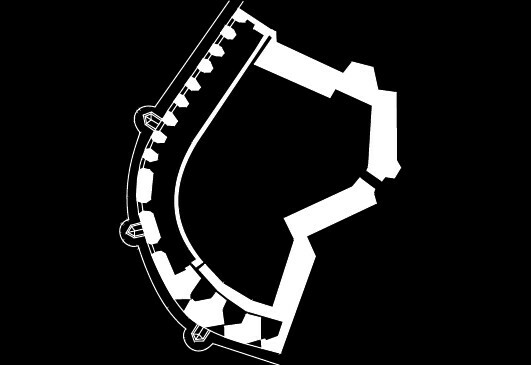 It is a similar design to the nearby Coalhouse and Cliffe forts, consisting of large, granite faced casemates with magazines directly beneath and a parade ground and barrack block at the rear. The casemates housed 11-inch Rifled Muzzle Loading guns, but the fort was later armed with Breech loaders and Quick Firing guns. Guns were also mounted at the fort during WW2. Unfortunately, much of the fort, including the barrack block, was demolished in the 1960s, and only the fronts of the casemates and underground passages and magazines remain. The fort is on open land and can be visited. In the last few years, the site has been landscaped and interpretation boards installed, although the entrances to the tunnels were also buried at this time. I used to hang around this fort in my teens as it was near to home but away from adults and i didn't have any idea that there was so much to it!!! We certainly never ventured into the passageways pictured here - would have been too afraid of getting in to trouble. when i was in my teens i used to spend a lot of time around the fort fishing and camping. i did go inside the fort with a friend on a couple of occasions and the water inside the fort was about 3 feet deep and very cold .does any one remeber the abandoned tank that was to the east of the fort.it was a canadian ram tank also known as a kangaroo tank. if you do ,do you know what happened to it? I used to frequent this fort as a lad in the the late fifties. 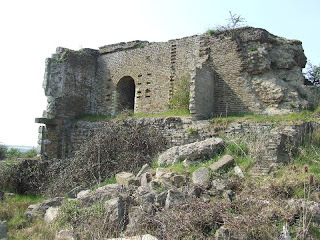 I remember being taken into the tunnels by a freinds father (they were camping near the fortat the time) At this time the fort was still 100% intact with various outbuildings and two large towers to the East of the fort and what looked like Barracks to the left. These outbuildings were obviously built after the main structure and were finished in stock bricks. During the early sixties i remember going into the magazines underground and seeing the chain blocks where the amunitions were hauled up to the gun placements. its good that you remember the tank.the tank was still there in the 80s and i remember when the sea wall was being re-enforced and the workmen cut part of the rear of the tank off and removed the engine from the tank.but it would of taken some doing to dig it out.you would of needed a jcb to dig it out.but anyway you are probably right its gone to a scrap yard somewhere. 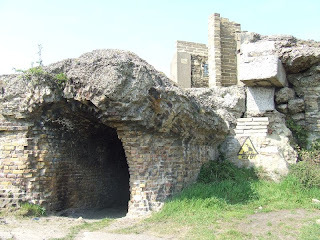 anyway i have posted some videos on youtube of some pillboxes that i see when im out and about in kent and sussex and i hope to go and visit the fort when i get some time. I Didnt realise that they cut the tank up! I had a joinery shop not far from the marshes and the guy that owned the local pub had all sorts of tanks and WW2 vehicles in his car park and I did wonder whether it was him!! Do you remember seeing the big concrete'Ears' that were built on the marshes further down river? I think they were some kind of listening devices, or so I was told when I was a kid. All I know was they looked really spooky in the fog at that age!! Regards Terry. I dont remember seeing the big concrete'Ears'.Iv tryed to find out if any acoustic mirrors were in the area but iv had no luck yet.Do you remember when you last saw them and how far down the river thay were?? As for the guy that owned the pub, i do know the pub your talking about, and if i remember correctly he had a 6x6 truck that he used to drive across the marshes and it might have been him who removed the tank. But it might of been anyone with the right kind of gear. Was out at the fort today (13/4/09) and dismayed by the legalised vandalism of the RSPB. An earth bank has been built around the inner curve, up to casemate floor level, blocking all sight of the entrances to the inner rooms. A pointless concrete staircase leads down from the casemate floor to the flooded plain and an information stand. All the shrubbery that was populated by who knows how much wildlife has been removed. By the RSPB! As for the pub owner with the tanks, he is no longer there and the pub is boarded up. The locals didn't like it apparently. Shame really. Another who used to frequent this place in his teenage years. Im sad to hear about what you saw at the fort. I have seen some pictures on the net on a web site and i could not understand why they have made it such a sterile place.:-(..sad. But mother nature will soon get its own back..;-)..happy. Anyway i will see if i can find the web site and copy paste it. I have been posting videos of some of the pillboxes i see on my travels on to youtube so if you get time have a look. Just type in pillbox vid 1 and you should find them. There are 28 so far ...;-) I know you probably think im mad and you are probably right. ps im called tacticalbattledroid on youtube. I've been trying to think where those concrete ears were. It was about fifty years ago when I must have seen them last!! but I think we used to go through Cliffe village and the road used to go down onto the marshes. I'm sure thats where we used to go. I can remember not staying there long because we thought it was some kind of spy centre!! Sometimes we would go through the old cement works and onto the marshes that way past the old gun pits so they could have been on the marshes there. Well i have tried to find any information about any acoustic mirrors (big concrete'Ears') but no luck yet.But im going to try the library to see if i can find some information there. The only other thing you could have been looking towards might of been the old WWI Munitions Factory on Cliffe Marshes. I know where the Munitions Factory was and we used to think it was an old temple of some sorts!! I was speaking to my uncle who used to work on the sea wall after ww2 and he thinks they were further down river past Cliffe. I wonder if you could find anything on an old Ordanence Survey Map of the Cliffe area? It would be very interesting if you could trace them. Sorry to say iv not had time to go to the library yet but iv got some time off on the 9th and 10th of june so i hope to get time then. I checked out that site you posted and found it very interesting. Especially the peice about building them in chalf faces. As you probably know the track that went down to the marshes at Cliffe villiage has chalk faces on either side of it when you finally get on the marsh. The more I think about it I'm sure they were on the left hand side as you looked towards Cliffe villiage from the marsh. I was back in the UK last week and was going to have a look but I ran out of time. I'm hoping to go back again at the end of June or July so I'll be having a look then. I've just had a thought, some years ago I was doing some research on the Maunsell Towers in the estury. I got in touch with a woman at the Royal Engineers museum in Chatham (Brompton) and she was very helpful, she even had all the information ready for me when I called there, all I had to do was tell her when I was going to call in. and maybe you could work out a grid reference for me. I also have some time off at the end of june and the start of july so i might get time to visit the fort. By the way i went passed the Chequers pub in lower higham and its a bit sad to see it borded up. Anyway a new planning application for affordable housing units on the land to the rear plus conversion of the Chequers Inn building into flats has been submitted. I like your plan to see if the Royal Engineers museum in Chatham will get you any info about the acoustic mirrors (big concrete'Ears') so good luck. I hope to go and visit the fort on the 8th of june. So i will be videoing the fort and posting it on youtube so keep a watch out for it. i've been looking at this site 4 a few week's now and i'm fascinated-I used 2 live in Church Street,Lower Higham as a kid-1964-1970-me and my school friends would often play around these fort's-this has brought back some happpy memories,thank u.Sad 2 hear that the Chequers pub has closed,me and my Dad used 2 support the Football team that was run from there when we lived just up the road from there,lovely memories thank u again. I used to play around here too, from around 1970-74. Great place to get away from adults. We always cycled down, and occasionally couldn't get across if there was shooting and the red flag was flying. There was a tree with a rope swing and we were always too scared to go far down the tunnels. We used to go to the rifle butts as well, and I can remember collecting empty .303 shell cases and sifting through the sand in the stop bank for the less mangled bullet heads. There were newts in the marshes too, and slow worms, and the occasional jellyfish in the river coming in on the tide. I recall the tank vaguely, a rusting hulk with no turret? Happy times. It's amazing to see pictures of where my my cousin and I spent pretty much every day of the summer holidays. 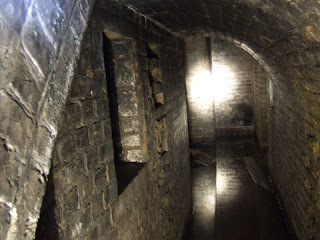 For as long as I can remember the tunnels have always been flooded, but we used to enter through the room to the left of the one you could access via the ladder, climb through the narrow window and then follow the passage right around until it led you out in the middle of the grounds. 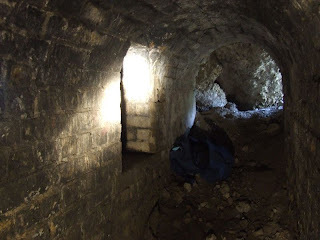 We were never brave enough to climb through the other windows that you passed, but there were rumours that there were connecting tunnels to Cliffe and Tilbury. Not sure if these were true. Now I'm 25 and brave enough but the tunnels have been cruelly filled over! Have visited this site on many occasions since 1990. Today was the first time in 7 years (due to moving away) and I was disgusted with the state of the site. Not only has the RSPB allowed the land around the fort to flood, which will probably undermine the fort in the long term but we now have horses roaming around the site and using it as a toilet. The RSPB staircase still rises out of the flooded land, you have to get your feet wet if you want to read the information board they have provided. The natural growth which used to grow around the fort hasnt returned either, and nothing has been done to deter the off road motorcyclists. I suggest that the RSPB looks after birds, and gets somebody else to look after this wonderful fort. Oh and without wishing to upset any twitchers they can also get the land immediately surrounding the fort drained to help its preservation. Its not as if we are short of space for wading birds as the RSPB have already managed to vandalise Rainham Ranges in Essex to make habitat for waders. Some sites featured are on private land and were either visited on official trips with the underground and research societies I belong to, or permission was directly sought from the owners by myself. Other sites featured here are open to the public as tourist attractions or are on public land, but care should always be taken when visiting as there may be hidden dangers. These pictures have been taken over a number of years, so it is possible that ownership/access may have changed. Many thanks to all those people who have taken the time to organise trips and to owners for allowing access and to the Palmerston Forts Society for permission to use some of their plans. Wow.Its great pictures.I think they have built long back., I feel strongly about it and love studying extra on this topic. If attainable, as you achieve experience, would you thoughts updating your weblog with additional information? This can be very helpful for me. I've just stumbled across your site, I must say the photo's of Shorme Fort (as we used to call it), brought back tons of memories. Me and my brother were frequent visitors to the fort in the late 70's early 80's and used to play there. 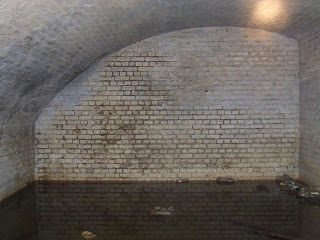 As others have said, we too were too scared to go down the tunnels, most had at least a foot of water in them anyway, and we didn't fancy a telling off from our mum, going home with wet trousers and trainers. We also used to play in the tank, if you could get past the cows and bull who gave us very dirty looks! I last visited it around 3 years ago and was disappointed with how it looks now, with the big mound of dirt blocking off all the doors. Thanks for putting the photo's up. Hi I used to hang around the fort, we used to swim in the thames just in front of the fort, I think the RSPB have made a right mess of it & as for blocking off the tunnels out of order, Just like they've done to cliffe marshes & they had the front to say it was for the wildlife. Pull the other one!. I believe tank was removed & is now sitting in a museum. I have already bookmark this article and will definitely refer this article to all my close friends and colleagues. Thanks for posting! Just after the war around 48/49 we used to walk along the sea wall past the Ship Inn to the fort, the large guns were still in situe then pointing across the Thames, there were still a lot of Ammo boxes lying around in one of the rooms on the lower floor and odd bits of army kit including steel helmets, I do not know if there was anything in the ammo boxes but they were still wired up and very heavy, too heavy for an eight year old to lift. Thats the best thing iv heard about the Fort so far from so far back and only just after the War but was the Tank there then ? As when i go through your post, It includes lots of interesting images to make a look into it. Keep posting more.. I was talking to a friend last week about the fort and the tank and he didnt remember it ! I can clearly remember climbing down in to the tank and pulling the levers which I can only assume were for steering it. (Bear in mind I was probably about 13 at the time ! )I am 40 now and still love the fort as much as I did as a child, it seems to set my mind working overtime about what it was like 70 years ago. I remember going in to the tunnels and can still remember that damp, musty smell as well. I cant imagine that the tunnels were filled in, just the entrances covered over with dirt. I reckon I could pretty accurately pinpoint where they were too, anyone fancy getting busy with a shovel ??!! These days I get out there at least two or three times a month with the dog and still admire the old place. Did we possibly have the best ever playground as kids ??!! I had my little adventure at the Fort the other day ... but even trying to get to the Fort was not as easy as i thought it would be as the level crossing at the end of Queens Farm Road was shut and not open to the public due to vandalism and had been shut and welded shut for some time as i found out from a few people who were also in the area so i had to park the car outside Nuralite Industrial Centre, Canal Road and cycle from ther to the Fort anyway i tryed to see if it was possible to get into the tunnels but without a JCB there was no way that i could find into the tunnels ... I now see that the cows that used to graz there have been replaced with horses which was a bit scary as who ever the owner was had herded them along the road back down towards the bottem end of the road and when i tried to go back to the pathway that runs along side the old canal the 53 horses that he didnt want to look at were coming back the other way so i had to cycle at top speed back to the Fort untill they had past ... well i did video the foreshore area in front of the Fort so if you want to see it just copy past Shornemead Fort Foreshore vid into any good search engine or on You Tube and you will find it ...also thanks Steve for your input to this ongoing posting of memories about the Fort ... i hope to be make another visit soon. Remember well the fort and the tank when we played there in the very early 1950's. Then it had names of downed and captured German pilots and aircrew in buildings on the fort roof. Disappointed to see it has been largely demolished. Read it was by army demolition team. I thought the tank was a 'Grant' as although the main revolving turret was missing there was another built in turret still there on LH side as faced. Had radial engine in rear. Always wanted one of its pistons. Someone had broken one of the cylinder heads open in the attempt to get one although it required more than that to access the gudgeon pin and circlips before removal. Regret it's gone as it was part of my childhood and our heritage although I am a romantic. omsAs a kid many many moons ago I used to go down to the Fort on many ocassions with other kids from the Denton area. There used to be a swimming pool outside the Fort to the west end. One of the older lads found the stop tap to the pool. He turned it on. come back the following day to find the pool almost full.We used to swim in it. Just to the east were two naval guns in a casement with the breech blocks removed. 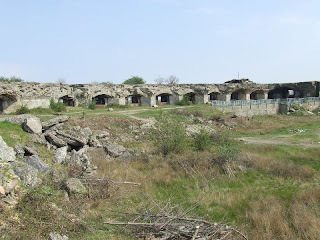 The Fort then was mainly intact together with the offices and walkways. The Royal Engineers were the vandals using demo charges. I got the impression that the Fort was used as a transit camp after the war for POW's waiting to go back home. On the north side there used to a walkway gantry into the river made up of scaffold poles. Also there were remains of a narrow slipway type of construction leading into the river. This turned out to be a torpedo ramp, for what purpose, I can only guess. Used to go into the Tunnels in the early 70's with a tourch it was flooded and waist deep as a kid i had some good times down there and remember the tank. Been down there recently and vandelised in my opinion such a shame was a great place to go and explore and camp out and fish done that many a time. another old git. Hello all. I was mucking about down at Shornemead fort since the early 60's (am 58 now) but just cannot remember anything that looked like a tank. Does anyone have a pic? I remember a couple of bottoms of rusted 'hulks' on the beach nearby though, probably 100 yrs old+? 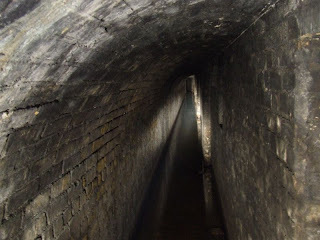 I 'braved up' and went solo into the tunnels with a torch and wellies - great fun. (I also remember a huge (to me) pile of wooden sleepers near Denton Wharf that was there for years and great to play on and in, make camps, take girls to ....... Good times. I've not been back for years, and have lived in Adelaide for the past 31 of them! Not so much history down here and you realise how much there is anywhere in the UK! Cheers. Les Burgess. My father was in the Royal Engineers during National Service, (I'm guessing late 50's early 60's) and remembers blowing bits of the Fort up as part of their training which I gather is the main reason it's so damaged. If you look on Google Earth you can also see a field of shell holes to the east of the fort, probably due to target practice. My older brother also remembers the tank though I can't recall it. I walked out there this evening and so much has gone of the lower level which was bulldozed and the tunnels blocked. However, there is still access to the lower levels if you know where to look though I haven't ventured inside myself. I also remember being warned as a kid about the deep water in the tunnels and the possibility of unexpected drops; we never seemed to have torches on us at the time. hi yes remember the fort and the tank well, used to fish in the near by lakes for rudd and eels, went through some of the under ground tunnels in the fort with torches, dodged the cattle as best i could and the odd bull, does anyone remember the creepy dong out in the river, it sounded like an old church bell ? and the old lighthouse, a friend and myself held onto the metal railings that went around that lighthouse with only a narrow rim of concrete to place your feet on . . . scary, but had to do it lol. i am 58 now so going back a bit. 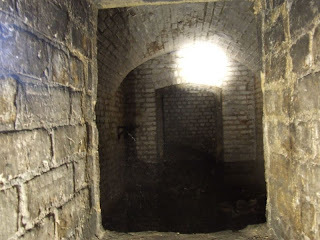 At 82 I remember the fort well.We used to go there along the sea wall from Gravesend in the late 40s-early 50s. It was still entire then. We used to put up a tent outside and then explore. There were still a couple of guns mounted but I dont recall a tank. We were told that German pows were held there. I remember them being marched into the Catholic church at Northfleet for Sunday mass. We used to explore the tunnels underneath but got frightened out by the rising tide. Happy days.